I was in the Trinity Theological College (TTC) library, when I heard the loudhailer blaring something outside. It must be some kind of celebration or a college event, I thought. Some time later, on my way to a lunch appointment, I caught sight of what was happening. It was a glorious sight. I could not believe my eyes. I had to take pictures to document this for my good friends and classmates Rev Benedict Muthusamy of Open Doors, Malaysia; Dr Tan Yak Hwee lecturing in Westminster College, Cambridge; and Raphael Samuel the Anglican Bishop of Bolivia. They would be delighted. I saw a sea of red: with students and faculty members and construction workers. 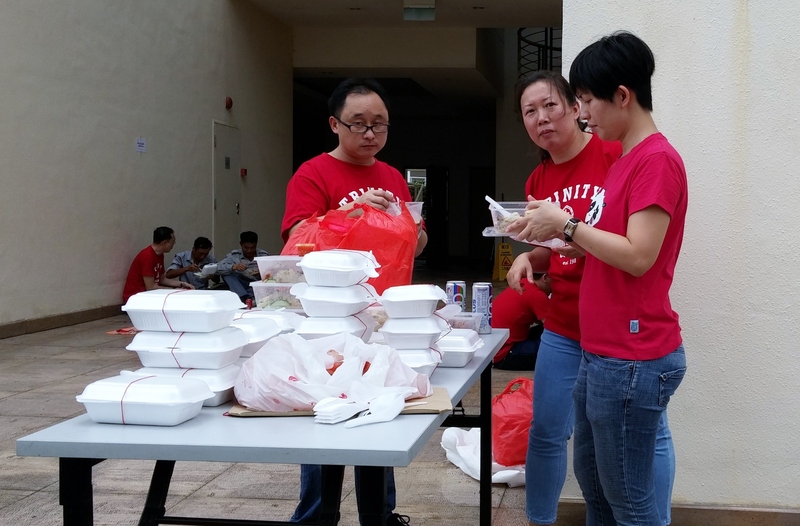 Most were seated on the floor, some were standing, and others were busy helping around. 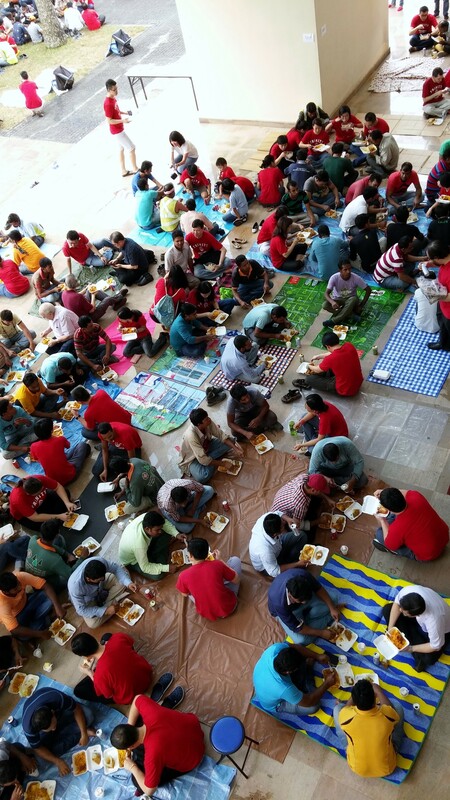 They were having lunch, the seminary folks and the construction workers who had been working for the past few years to build the MRT station a stone’s throw from the college entrance: the Hillview MRT station. I asked Veronica from TTC office, What is happening? 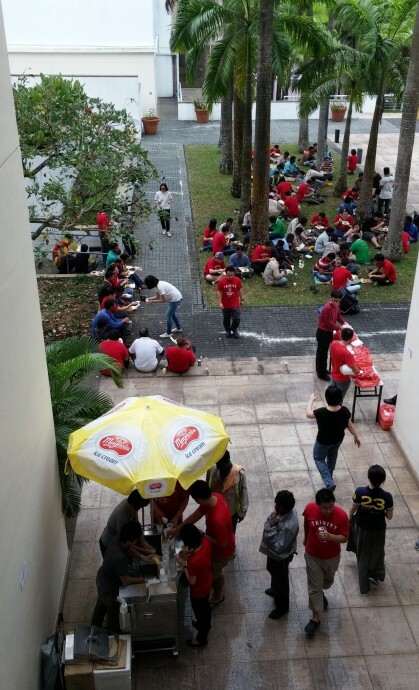 Oh, the college decided to serve lunch to the “unsung heroes”: foreign workers from Lanka, India, Myanmar, Thailand, China, Korea that had been working on MRT station works just outside the college. I was pleasantly surprised at TTC’s gracious act of hospitality, even if it was a symbolic once off event. You know, after all seminary do not do such things. 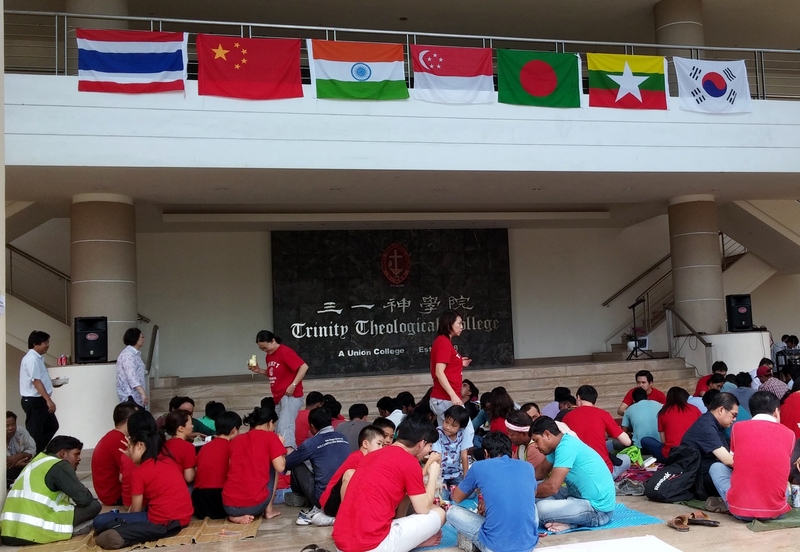 The foreign workers would have seen the big seminary sign at the main road, and may have known that this is the place where Christian workers and pastors were trained. For them to receive hospitality and thanks in this fashion is something they will remember for a long while. Just as significant the seminarians have begun to learn by actual doing the sacred art of showing hospitality to the “stranger” or “alien”. This is a true curriculum which educates the heart, a curriculum as important, if not more important, than learning in comfortable lecture rooms and library. This is theology of the heart. Theology 101, Jesus way. The Bishop of the Anglican Church in Bolivia is a good friend of mine! We did theology together in Trinity Theological College. As a student he was a sharp and creative thinker, good at thinking provocative abstract ideas that stretch your theological world to the edge. Together with Rev Benedict Muthusamy, we were pals who had long teh tarik sessions about theology, society, politics and …..our lecturers. The charismatic movement was very strong in some of the Anglican churches and for field education he served in Church of our Savior. I was his bestman when he married Michelle at a wedding at Church of our Savior. Rev Derek Hong was one of his heroes and the officiating minister, and I distinctly remembered how the reverend wore hip jeans and moccasins under the Anglican whites and how the wedding was saturated with worship and prophecies. The venue was the old chapel at Prince Charles Crescent. 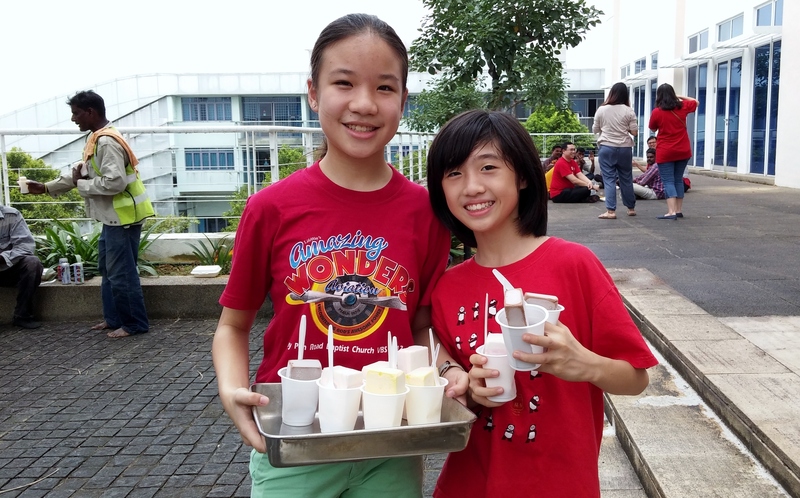 After our graduation we met regularly to encourage each other and share about our respective ministry and struggles. When our seminary classmates were in town I made arrangements for class meetings. I remembered it was a big decision when Raphael and his wife Michelle decided to answer the call to Bolivia. The prayers, the deliberations, the anxieties about adaptation and their son, Elijah. I thought they displayed courage that could only come from receiving God’s call and promises. You can read the whole story of the process of answering the call in “Going to Bolivia” in his blog. When he came back for furlough we always meet for fellowship and it was an opportunity to bring back as many of the classmates as we can together. I feel so proud, so pleased for him that he has become the bishop. It is not the prestige or status that it confers on him. 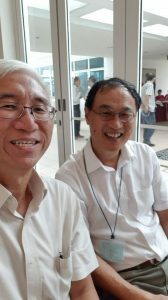 Nor is it the often unnoticed fact that the Diocese of Singapore has produced two minority race Indian bishops in a Chinese dominated clergy – a credit to the diocese. 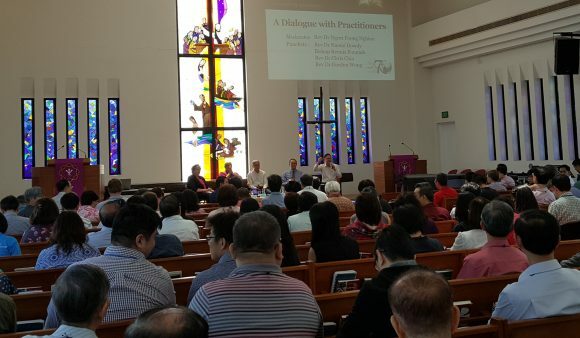 I feel that with his knowledge and experience and intelligent reflection from years of parish work both in Bolivia and Singapore, he will certainly do a good job of it. He has a clear idea of what needs to be done and he has the passion and contextualization skills and competencies to succeed. The Bolivian diocese and the wider church there will only benefit from his being in this leadership position at this juncture. Glory to God! 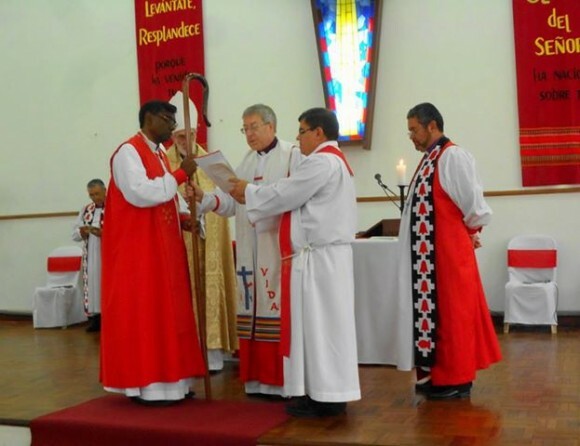 Our congratulations to Rev Raphael Samuel (BTh 1985) and his wife, Michelle Lee Hock Sim (BD 1984) on Raphael’s election as the Bishop of the Anglican Church in Bolivia, South America. The consecration will be held on 12 May 2013 in Santa Cruz, Bolivia. The Bishop Elect of the diocese of Bolivia, Ven. 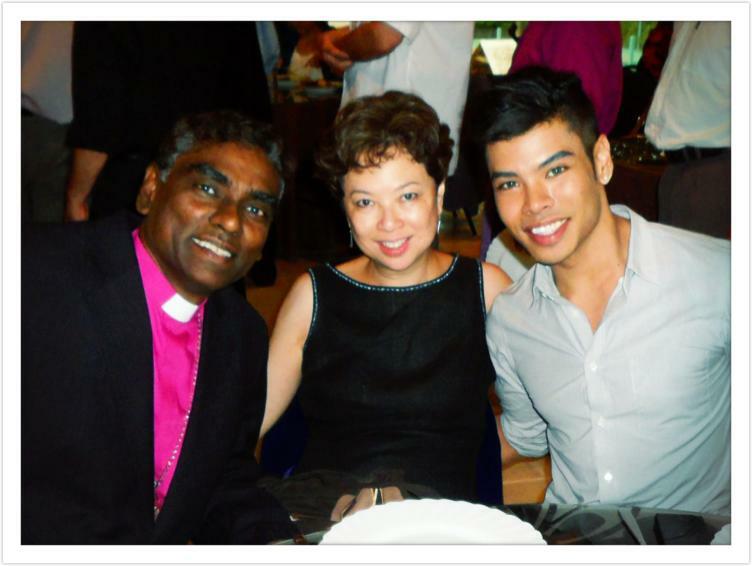 Raphael Samuel, is a Singapore clergyman sent by the Diocese of Singapore to serve in Bolivia. He and his wife, Michelle are the longest-serving missionaries in the Bolivian Anglican Church. Raphael, a Singaporean Tamil, was born in January 16th 1957. He was raised in a traditional Anglican parish and received Christ when he was a teenager. He hails from several generations of Anglicans and was educated in a Methodist school. 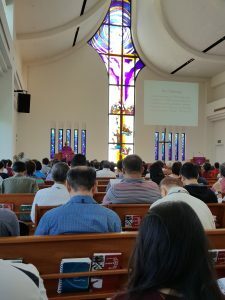 After formal studies, he joined the Singapore Navy in 1974, after which he responded to the Lord’s call to serve in the Anglican Church in 1980. At this juncture, a life-changing experience of the Holy Spirit, left a deep and lasting impression on his life. As part of his preparation for full-time ministry, he studied theology for 4 years at Trinity Theological College, where he and Michelle met. The communal setting at St Peter’s Hall, an Anglican institute for ministerial training in the campus at Trinity, served as an integral part of his formation as a priest in the Anglican Church. The Straits Times reported his consecration HERE.